21' 2" 22' 2" 19' 0" 0' 10"/5' 0" 28' 0"
Approx. trailering wgt. : 2,200 lbs. Harry Sindle, designer and builder of the Newport 212, first started racing in the mid 1940s in a Lightning. 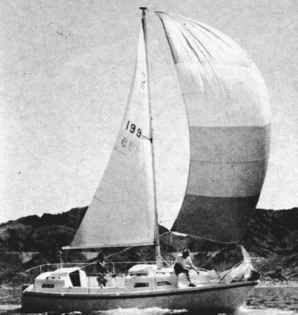 Later he became class champion in several classes, and felt that light weight was a very important advantage in attaining boat speed. "Except in keel boats," said Harry, quoting fellow designer Uffa Fox, "weight is only good in a steamroller." Sindle designed several boats featured in this book, namely the Newport 17, Newport 212, and Newport 214. Best features: The biggest advantage of the 212 over her comps is her higher Space Index, a result of comparatively generous freeboard. We also like her spacious cabin layout, complete with dropleaf table, and her shallow draft and smooth bottom with board up, intimating an easy trip on and off a trailer. And her specs make her look faster than her PHRF rating of 267 would indicate, in spite of a somewhat lower S/D, and an extra 100 pounds of displacement compared to her comps. Worst features: Immediately noticeable in her inboard profile drawing is her unusual centerboard lifting gear and storage position. All we can say is that it looks complicated, and when it comes to centerboard arrangements, after some bad experiences, we have come to prefer simple.